Mumbai Masters managed to eke out a hard-fought 3-2 victory over Banga Beats in their opening encounter of the inaugural Indian Badminton League (IBL) at the Siri Fort Sports Complex in New Delhi on Thursday. World No 41 Vladimir Ivanov of Russia notched up a straight-game win over India's top shuttler Parupalli Kashyap in the opening match. Kashyap had a good beginning to the day when he jumped three places to World No 14 in the BWF rankings. But he couldn’t double his joy on the day and failed to quell the challenge from the Russian, losing 18-21, 18-21 to concede Mumbai Masters the early lead. However, Tai Tzu Ying of Chinese Taipei brought Banga Beats back into the contest with a thrilling victory over three-time All England Champion Tine Baun in the women’s singles. Tai Tzu scripted a 21-17, 21-18 victory over Denmark's Tine. 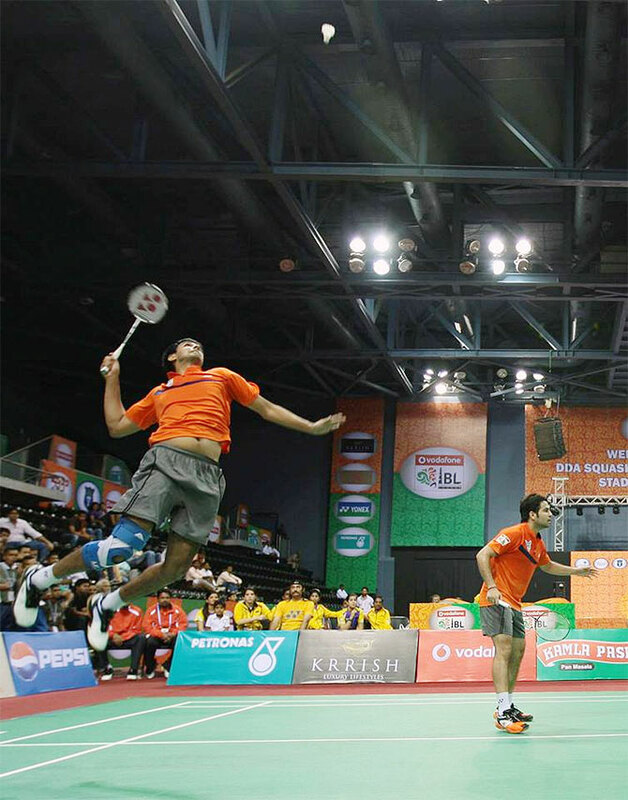 Bangalore then made it 2-1 when their men's doubles pair of Carston Mogensen and Akshay Dewalkar thrashed Mumbai's Pranaav Jerry Chopra and Manu Attri 21-13, 21-12. The second men's singles was another enticing match between players of equal caliber as Marc Zweibler of Germany and Hu Yun of Hong Kong clashed, cheered on by a vociferous crowd of around 200 spectators even as the match ended at midnight. After an intense battle which saw fortunes fluctuate in both side, it was Marc who was awarded for his resilience and he stunned Hu 17-21, 21-17, 11-6. In the deciding match, Vladimir Ivanov and N Siki Reddy defeated Akshay Dewalkar and Aparna Balan 21-18, 21-19 in the mixed doubles competition to guide Mumbai to a thrilling 3-2 win over Bangalore. With this win, Mumbai bagged four points, while Bangalore gained two points. Earlier, in the first men's singles, Kashyap took a 7-2 lead at the break but Vladimir turned the tables at the second interval, moving up to 14-12. Although, Kashyap clawed back at 15-15 and reached to tally 18-18 with a smash but Vladimir pocketed the next three points to grab the advantage. In the second game, Kashyap was more attacking and that helped him race to a 7-2 lead at the first break but Vladimir made it 8-9 with some counter-attaching strokeplay. Vladimir fought back brilliantly but the Indian was able to keep his nose ahead at 14-10. Kashyap got points with his sharp angled smashes but he also committed few unforced errors as Vladimir kept breathing down his neck even after the break. Kashyap lost a few points at the net and also failed to handle his rivals smashes to allow him to level par at 18-18. But a couple of miscued shots and Vladimir was just one point away from a stunning victory. The next point too went Vladimir's way as Kashyap had no answers to his smash. In the second match, the past reputation of Tine Baun didn't matter as Tai Tzu went about her business with ease and though the Danish shuttler provided a great fight, she couldn’t match her gutsy opponent. Tai Tzu anticipated better and had better court coverage. Tine involved her rival in long rallies but she could not finish off the points. Her strokes went wide and sometimes got buried at the nets as Tai Tzu came back victorious. In the second men's singles, Hu reached 7-4 at the break but Marc took three points to make it 7-7. Hu and Marc advanced to the next break at 14-12. Hu smashed his smashed and forced mark to commit unforced errors to lead 17-13. Hu's inaccurate placement of his returns and smashes allowed Marc to claw back at 17-17. Hu, however, didn't allow the lead to change hands and after taking three straight points, engaged in a fast rallies and finished it with a smash. While the competition was on in full flow, seen in the stands was Telegu superstar, Nagarjuna who also obliged his fans with autographs. Marc tried to resurrect his fate in the second game and opened up a three point lead at the break. There was very little to choose between the two as both played an attacking game and waited for the other to commit mistakes. At the second break, Marc managed to hang on to a two-point lead. A deceptive slice and an aggressive parallel game, helped Hu claw back at 14-14. But Marc matched Hu shot for shot to cut down on his errors to move to 19-15 and with Hu hitting far and wide, mark made a hard earned comeback into the game. The decider turned out to be a roller-coaster ride as both Marc and Hu didn't give an inch as the former moved into the break with a 6-5 lead. The German held his nerves in the long aggressive rallies and eventually sealed the match with a backhand smash.